Without a doubt, the Minnesota State Fair is synonymous with food. Check out this all the new foods that will be available at the State Fair this year. The state fair runs from August 24 – Labor Day, 2017. The Minnesota State Fair makes Dusty and I think of loaded (and glutenous) nachos. This is our version of loaded nachos that are plant-based! Much less guilt is involved even if you decide to make a meal out of these nachos, which we’ve done too many times to count. Pro Tip: Make the Lower-Sodium Cauliflower Taco Meat First and then make the Cashew Queso while the Taco Meat is cooking in the oven. 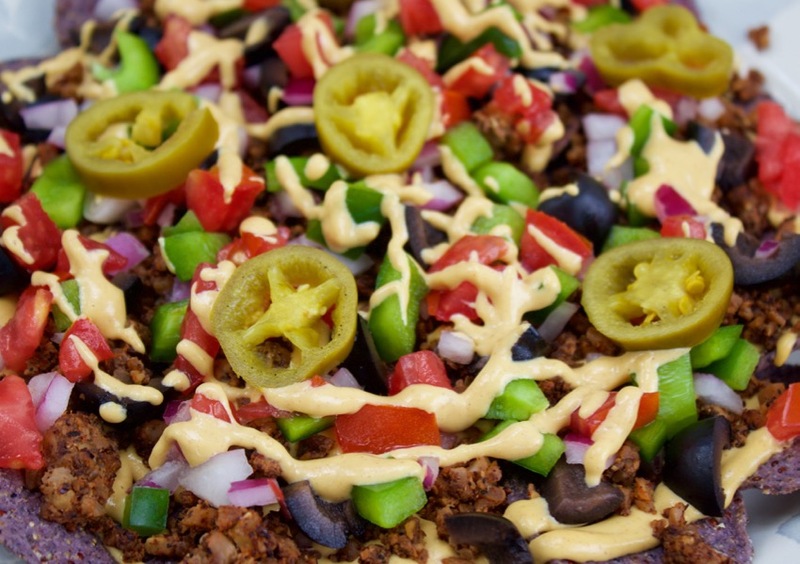 In order to make these vegan loaded nachos, you’ll first need to make 2 recipes. Combine the Cashew Queso with our other go-to recipe, Cauliflower Taco Meat and you have yourself a killer combo of meat-free and dairy-free, AMAZING nacho ingredients. There is so much flavor in these nachos, you won’t miss the meat or the dairy- trust us on this! First up is the Cashew Queso and it’s taken directly from Life is No Yoke. The recipe is so good the way it is there is no need for adjustments. Well, that’s not entirely true. We did make one adjustment to the recipe. We doubled it!! Another truth is that we bought our Vitamix because of this cashew queso and the Vitamix reviews on their blog. We are 100% satisfied with our Vitamix and are over the moon about their blog! This recipe is doubled. We figure when you make something this delicous it just makes sense to double it. Feel free to make half the recipe, but really, why would you want to? Add the liquid ingredients to your blender. If using a Vitamix, select the 'soup' setting. If you don't have a Vitamix or high-powered blender, you'll need to blend for 6 minutes. You'll want to start at a low speed then ramp up to high and let the ingredients blend for 6 minutes. 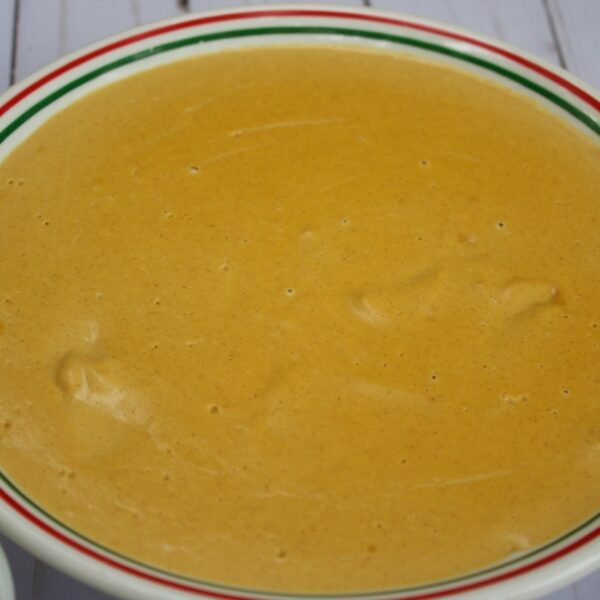 Here is a big bowl of the queso, use a spoon to drizzle it over your food or use a chip to dip! Next up is the Lower Sodium Cauliflower Taco Meat. This is an incredibly tasty recipe and we found on Brand New Vegan. It’s another recipe that will make a meat lover consider a non-meat alternative. We feel the key to this recipe is that we use quality spices- Penzey’s is our preferred spice these days but do not let the brand of seasoning stop you from making this recipe. Whatever you have on hand will be fine! 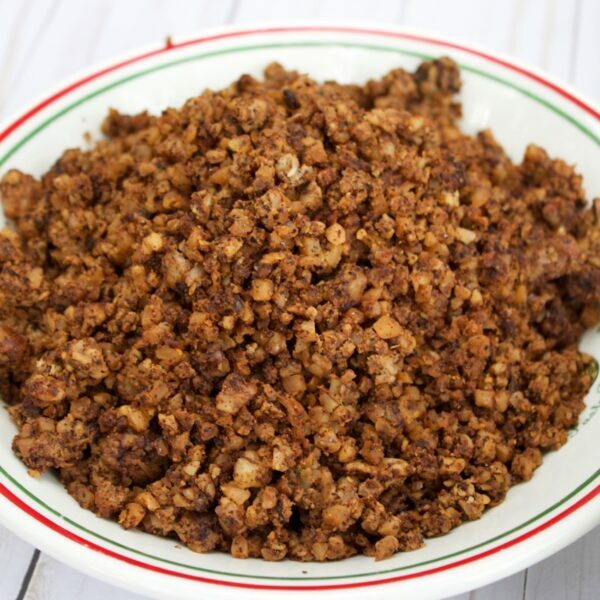 The Lower Sodium Cauliflower Taco Meat another recipe that will make a meat lover consider a non-meat alternative. We feel the key to this recipe is that we use quality spices- Penzey’s is our preferred spice these days but do not let the brand of seasoning stop you from making this recipe. Whatever you have on hand will be fine! Another thing about the recipe posted below is that we like convenience whenever possible in the kitchen without cutting quality. Rather than a head of cauliflower, we use a bag of riced cauliflower from Trader Joes- SO easy and quick! Using a food processor, lightly pulse the mushrooms until they're similar in size to the riced cauliflower. Or finely dice them with a knife. Pour into large bowl. Using a food processor, lightly pulse the mushrooms. If you do this in the food processor, do it separately from the mushrooms so it doesn't get mushy. Or finely dice them with a knife. Add to mushroom mixture in the bowl. Stir in liquid aminos or low-sodium soy sauce and mix well. Spread the mixture onto a baking sheet covered with parchment paper or Silpat mat. Bake for 45 minutes. Lightly stir every 15 minutes. Taco meat is complete. 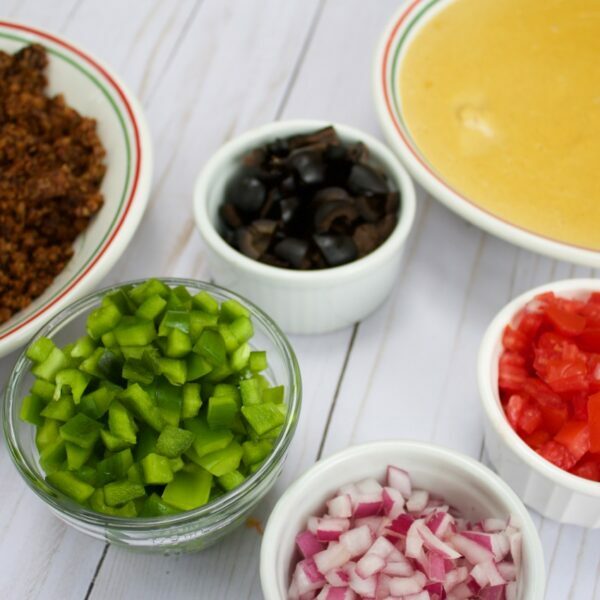 Add your favorite toppings and enjoy your meat-free tacos! Who would know this isn’t ground beef? It’s been kid-tested by our nieces and they didn’t have a clue and this is one of their favorites. After you make the recipes cashew queso & cauliflower taco meat gather your favorite toppings for nachos. We love all the toppings so ours include: diced red onion, diced tomatoes, green peppers, jalapenos, banana peppers and black olives. It’s also important to use a sturdy tortilla chip. We prefer Trader Joe’s Blue Corn Chips because they stand up good to ALL of our favorite nacho toppings. We hope you enjoy this recipe! If you make it, tag us using #diningdusterkitchen so we can see your creation! 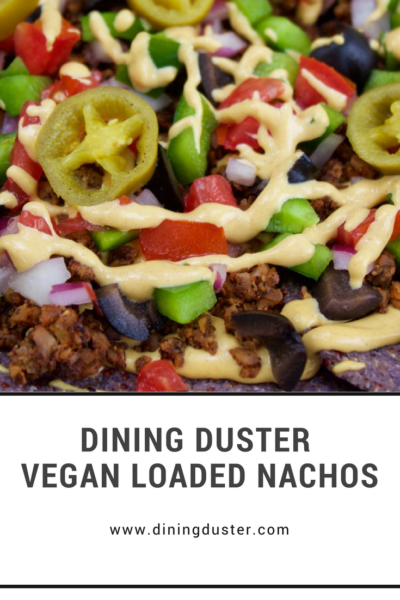 Before you go, here is a Pin for you so you don’t lose our Vegan Nacho Recipe! Thanks, Michele! They are so good. We think you’ll like them. There’s something seriously rewarding about being able to reproduce some of your favorite recipes from eating out at home. I’m adding that queso to my must-try list! Couldn’t agree more! This is even more of a win for us because of them being plant-based. We call that practically guilt-free. LOL. You should make that queso ASAP!! We totally agree, Charlotte. We hope you try the queso and like it! These look delicious! Pinning this so that I can make later. We hope you try and like them! I’m copying down your Cashew Queso recipe right now! I’ve been looking for a cheese substitute for a while now. I think you’ll love this. I will send more your way. We’ve been experimenting. Ha! 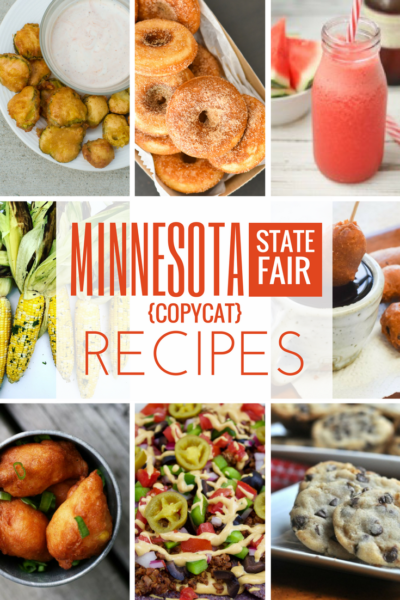 Such a good idea to make vegan versions of State Fair recipes! Those nachos sound delicious! I have heard such good things about using cauliflower in things like this, yet I have never tried! I really need to do that sometime! Beth- if you’re anything like us you’ll wonder why you waited so long! I can’t believe this is Vegan!!! It looks so good!!!! Dee- our sentiments exactly!!! We went plant based in January and we say that exact sentiment every time we eat it!! I hope you try it and like it! Whoa, these look so good! I am totally pinning this to try later! Kate- thanks for the pin. We hope you make it and like it! These look amazing! Gets me really excited for the fair this year!! Yes! It’s a good way to build some excitement, that’s for sure! Can’t wait to try this queso recipe in my Vitamix! You’re going to thank me when you do 🙂 Seriously, let us know if you like it….I don’t exaggerate when I say that we make it weekly. YEs!!! Cauliflower for the win! RIGHT?! It’s so good and we always say, ” I can’t believe it’s cauliflower”! These look amazing! Cashew cream has been my new obsession, but I haven’t tried queso! Going to be next up on my list! You won’t regret it!! Oddly enough, we haven’t tried the cashew cream. Let us know a good one to try!